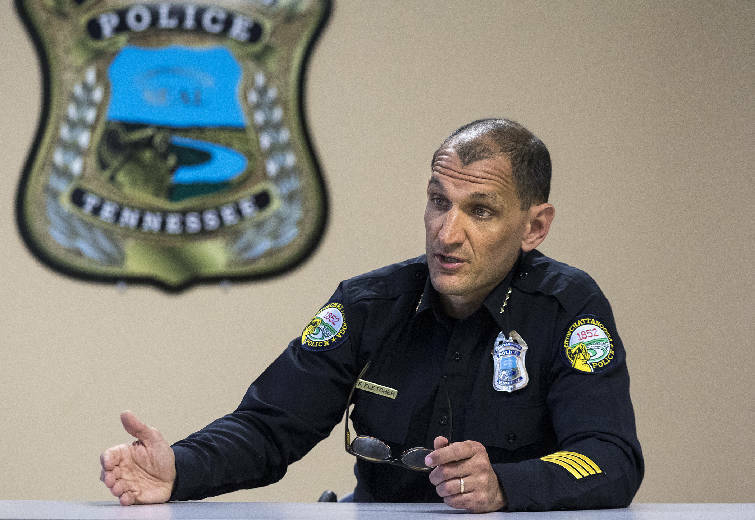 NASHVILLE — The police chiefs of Chattanooga, Nashville and Memphis are among 130 top law enforcement officials from across the nation calling for an end to "mass incarceration" in the United States while maintaining public safety. The officials have formed a new group, Law Enforcement Leaders to Reduce Crime and Incarceration, whose leaders announced on Wednesday in Washington the group's policy agenda "to push reforms to reduce incarceration and strengthen public safety." The group's leaders will meet today at the White House with President Barack Obama, who has called for reduced prison sentences and alternatives to incarceration for nonviolent offenders. Chattanooga Police Chief Fred Fletcher, Memphis Police Director Toney Armstrong and Nashville Police Chief Steve Anderson are listed as members of the organization, which includes individuals who lead or have led law enforcement agencies or associations and current and former prosecutors at the local, state and federal levels of government. The group's members also include Little Rock Police Chief Kenton Buckner and Nashville lawyer Hal Hardin, who was the U.S. attorney for Middle Tennessee who led the investigations and prosecution of top state officials in the 1970s. The group's formation and goals come at a time when Tennessee officials are considering longer prison stays for more serious offenders and for people convicted multiple times for domestic violence, drug trafficking and home burglary. A 27-member Task Force on Sentencing and Recidivism, appointed by Gov. Bill Haslam last year to examine whether the sentencing system in place since 1989 is adequate today, completed its work in August and delivered a set of recommendations to the governor. Haslam is considering what he wants to present to the state Legislature in January. The state panel recommended "truth in sentencing" for felony convicts, requiring a clear minimum period of incarceration be known to defendants and victims at sentencing. Convicts now are given a release-eligibility date that, for typical offenders, is at least 30 percent of the sentence, but good-behavior credits earned in prison and other early release provisions can shave more time off that. And the task force recommended making a third or subsequent conviction of domestic violence assault a felony rather than the misdemeanor it is now. State Commissioner of Safety and Homeland Security Bill Gibbons, co-chairman of the task force, said in August that in addition to "truth in sentencing" there was a consensus among members "that we need to make smart use of our prisons by using them for the more serious offenders, we need to be smart in coming up with effective alternatives for the less serious offenders and we really need to do a better job in reducing the number of repeat offenders." State Rep. John DeBerry, D-Memphis, said in August that the group realized "we can't just continue to lock up as many people as we're doing and basically throwing away the key and eating up as many tax dollars as we have. I think everybody entered the task force with a realistic attitude that we've got to make some changes. I just hope that the folks who can be rehabilitated — people who can learn, people who can be cleaned up after their addiction, folks who can go back to their families and become productive citizens — I hope we move every obstacle to doing that because we make every felony a life sentence, and that's something we've got to change." "Good crime control policy does not involve arresting and imprisoning masses of people. It involves arresting and imprisoning the right people. Arresting and imprisoning low-level offenders prevents us from focusing resources on violent crime," Chicago police Superintendent Garry McCarthy said. "While some may find it counterintuitive, we know that we can reduce crime and reduce unnecessary arrests and incarceration at the same time." * Increasing alternatives to arrest and prosecution, especially mental health and drug treatment. Policies within police departments and prosecutor offices should divert people with mental health and drug addiction issues away from arrest, prosecution, and imprisonment and instead into proper treatment. * Reducing unnecessary severity of criminal laws by reclassifying some felonies to misdemeanors or removing criminal sanctions where appropriate. * Reducing or eliminating mandatory minimum laws that require overly harsh, arbitrary sentences for crimes. * Strengthening ties between law enforcement and communities by promoting strategies that keep the public safe, improve community relations and increase community engagement. Contact Rick Locker at locker@knoxnews.com or 615-255-4823.